To parents, guardians, godparents, grandparents and all other family members and friends: A child you love will soon share in the sacred meal of Communion, also called Eucharist. May your personal words of love and faith be for this child a blessing and a keepsake of remembrance. First Eucharist or Communion is one of the important faith milestones in a child’s life. This Keepsake invites those who know and love the child to participate by writing words of blessing and love. 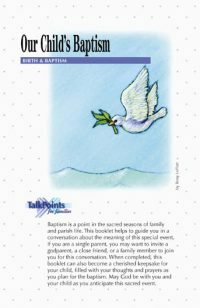 Those who work with congregations that celebrate First Eucharist or First Communion will find this to be an attractive and popular way to involve parents, guardians, godparents, grandparents and others in the celebration of a child’s First Communion or Eucharist. The cards are sold in ten-packs (only $4.95) with the hope that each family will give or send keepsake cards to all who they would like to be included in creating a meaningful keepsake blessing for their child. Plan to order one ten-pack for each family. What a great way to remind the child for years to come of all those who shared their love and blessing on the day of his/her first communion.